Congratulations on your new puppy & new member of the family! Congratulations on your new member of the family. Whilst this is a very exciting time for you, keep in mind that it is a unnerving time for your puppy as they are in unfamiliar surroundings. This fact sheet should help you prepare for everything they need. 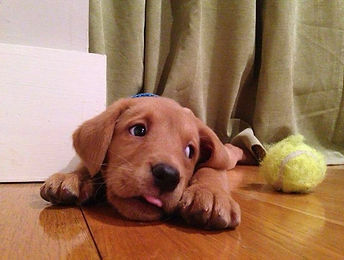 Sleep is an important activity for puppies. 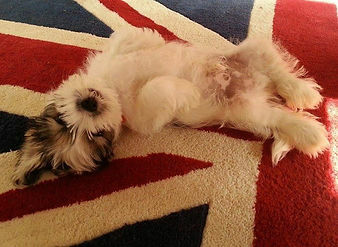 A bed for your puppy should be arranged somewhere quiet and out of the way; a place where your puppy can be left alone. Some people like to invest in a puppy crate/cage. These are a good idea but should be treated as a relaxing place for your puppy, and never be used as a punishment. We recommend puppies attend training classes, even if you have an idea on how to train your puppy, as it is good for socialisation (more on this later) and you can meet other new owners (we also hold puppy parties here, which are also great for socialisation). Another good thing to do on a daily basis whilst still a puppy is doing a ‘vet check’ at home regularly. This includes looking in their eyes, ears, mouth, running your hands over their body and touching all their feet. This gets them used to having these areas examined. Many puppies will come home with their own food that they have been fed whilst still with the breeder. When it comes to what to feed your puppy there is not one perfect diet for all, it’s what works best for you and your puppy. Any change in diet should be done gradually, introducing a small amount of the new diet to the current food until the previous diet is phased out. On average this normally takes a week. Amounts to be fed vary on the diet, check the back of your feed packaging for details. The initial puppy vaccinations are two vaccines two weeks apart, the first usually at 8 weeks old and the second vaccination at 10 weeks of age. We advise pups are kept in for 1 week after the 2nd vaccination, to allow for full immunity before going out. This primary vaccination course is topped up yearly in a booster vaccination, at which point we will also do a thorough health check. We also offer a vaccination against Kennel cough and Rabies vaccinations. Please call the surgery if you have any questions. For more details see our vaccination page. Microchipping is now a legal requirement for all dogs. If your puppy has not yet been microchipped we can do this anytime from their second vaccination. Fleas are known to cause irritation to all pets however are particularly a concern in young puppies, a heavy burden can cause anaemia. There are a few different products available so please ask for advice on the best product for you and your puppy. For more information please see our page on fleas. 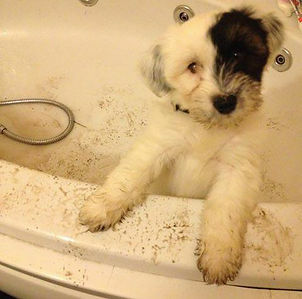 A regular worming regime should be started as soon as you collect your puppy. We advise worming every 2 weeks with a suitable wormer up to 12 weeks of age, then continuing monthly from 12 weeks to 6 months. After which 3 monthly is usually sufficient for roundworm and tapeworm (wormer dependent). You should discuss the best regime for your dog with your vet. For more information please see our worming page. Socialisation is very important for puppies. There is a period up until about 16 weeks of age, where puppies are more tolerant of experiences and therefore more likely to enjoy and learn from them, and less likely to be afraid. Puppies should be gently and carefully exposed to as many experiences as possible, both inside and outside the home. It is important that this socialisation is done carefully, to build up the puppy’s confidence and stopping if the stimulant starts to frighten him. A pup that does not receive adequate socialisation can develop unwanted behaviour traits. Socialisation is actually very simple; it’s just a case of making sure the puppy has as many good experiences with as many new people/things as possible when young. When a puppy arrives at its new home, it should be left alone for short periods of time, in order to learn how to behave when left. It should also experience short and regular car journeys. These are held regularly at our Swadlincote practice with a qualified veterinary nurse, they are designed to help your puppy interact correctly with people and other animals and accept new experiences. This is also an ideal opportunity for a puppy to become accustomed to the vet’s waiting and consulting rooms without experiencing any treatment and will provide the owners with an opportunity to discuss any concerns they may have, in a relaxed atmosphere. Please contact our surgery on 01293 213707 to book onto the next party if you want to take part. When you take charge of your new puppy, he may be insured for a short period of time under the breeder’s cover. We highly recommend you take out insurance and keep them ‘Insured For Life’, rather than a 12 month policy. If your breeder has not provided any insurance we can organise 4 weeks free with Pet Plan when you next visit us, who will then contact you regarding the continuation of cover. For more information please see our pet insurance page.